Soft, fresh ricotta cheese is a wonderful, light additive to many dishes – traditional Italian fare such as pastas and pizzas, delicious desserts like cheesecakes and cannoli, or simply smeared across a slice of toasted semolina. It also works surprisingly well with simple scrambled eggs. The origins of ricotta are, like most food history, a tad sketchy, but are believed to lie in the Sicilian region ofItaly. 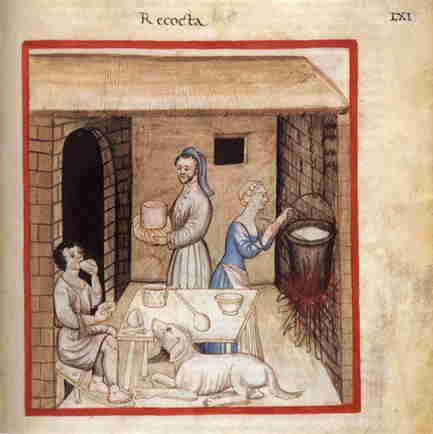 There is a lovely illustration (claimed to be the first) of ricotta-making in the medieval health guide Tacuinum Sanitatis. Ricotta was considered to be very healthful and to aid the digestive system. Surprisingly, ricotta is not actually a cheese. The word derives from the Latin “recocta” (recooked), because it is produced from the whey (byproduct) of cheese-making. Originally made from sheeps’ milk only, today ricotta is also made using cows’ milk. If you cannot find fresh ricotta in your local Italian specialty shop, I urge you to try making your own as we’ve done on this blog in the past (http://www.charlesprogers.com/blogs/archives/6283). 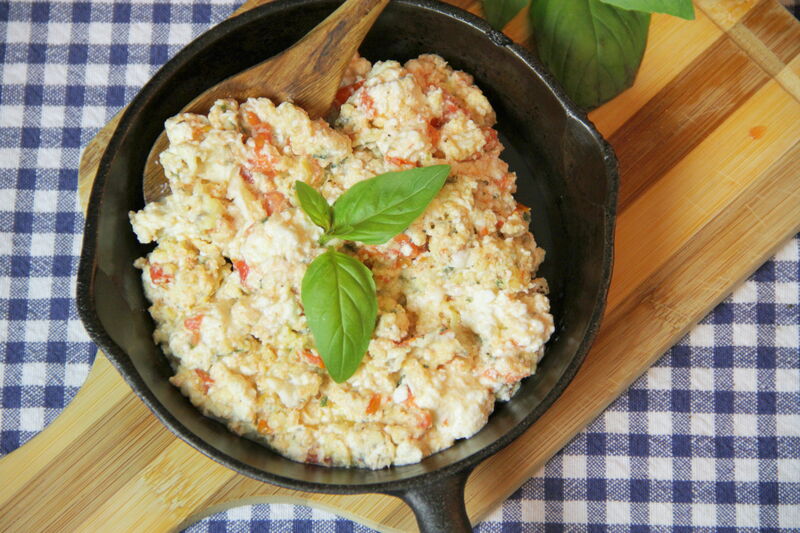 The mild flavor and texture of freshly made ricotta will enhance and enrich the flavors of your home-cooked meals. To put an Italian spin on this recipe, I started with a ripe, red Roma tomato, sautéed in a touch of olive oil. 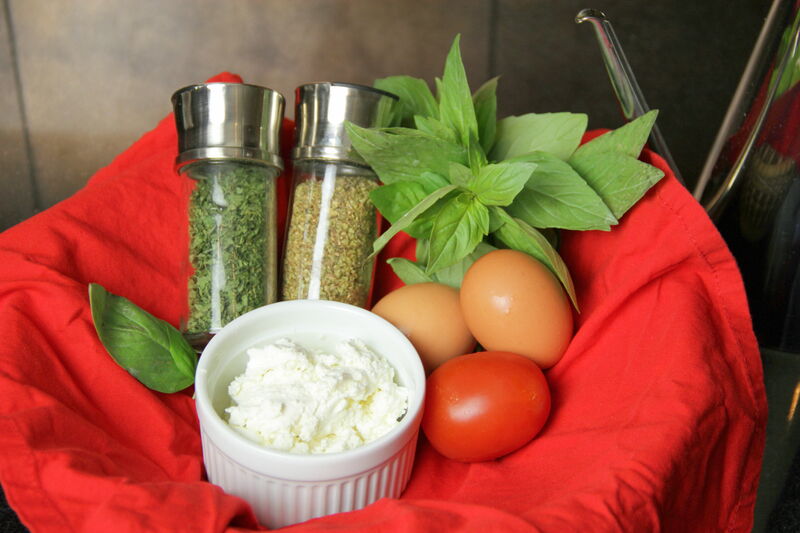 Then, I added some dried oregano and parsley to the eggs before cooking, added the fresh ricotta near the end, and topped it all off with a handsome sprig of fresh, green basil. Enjoy these fluffy eggs on their own, or serve them with spicy Italian sausage and a big hunk of toasted semolina for the full experience of an amazing breakfast in bed, Italian style. Heat olive oil in small, heavy pan over medium low heat. Chop tomato into small pieces and add to pan. Cook until tomato is warm and softened, about 3 to 5 minutes. 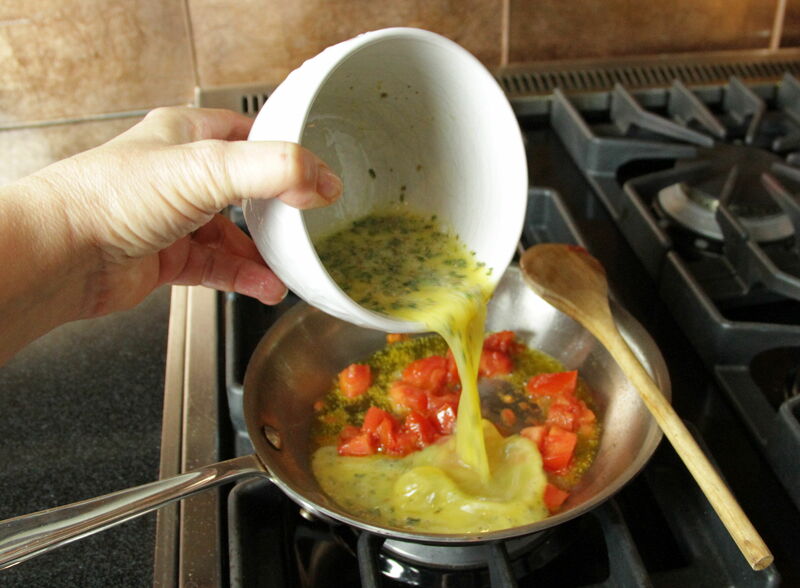 Break eggs into small bowl and whisk well with oregano and parsley. Add egg mixture to heated pan and allow to cook slowly and gently. Stir and lift frequently with wooden spoon to avoid sticking. Toward the end of cooking, add ricotta cheese and fold into the eggs, just to melt slightly and heat through. Season with salt and pepper, garnish with fresh basil leaves and serve immediately. 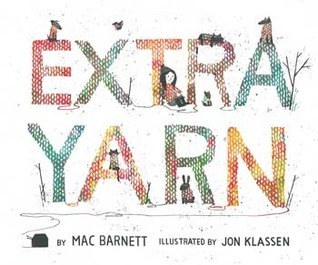 Extra Yarn by Mac Barnett and Jon Klassen. Mac Barnett and Jon Klassen are two of my favorite children’s book creators out there. I’ve reviewed books by each of them more than once. Mac Barnett’s Guess Who? Billy Twitters and His Blue Whale Problem and Chloe and the Lion are all wonderful, hilarious books. 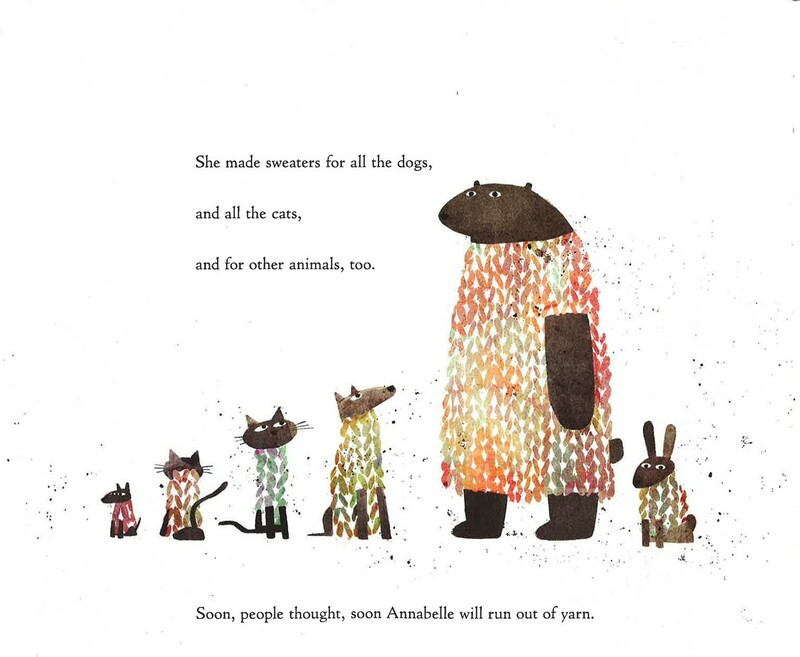 Jon Klassen’s I Want My Hat Back was, in my mind, an instant classic. This collaborative book with Mac Barnett providing the story (Chloe and the Lion showed us definitively that this man cannot draw) and Jon Klassen doing the illustrations is a bit of a departure from their usual style. Nevertheless, it’s still a wonderful book. My son is crazy about it. It reads like a story out of a book of fairy tales, maybe Russian fairy tales. Annabelle lives in a cold, drab town. When she discovers a box of brightly-colored yarn, she decides to knit herself a sweater. With the extra yarn, she knits one for her dog. With the extra yarn, she knits one for her neighbor and so on. It soon becomes clear that she will never run out of yarn so after outfitting the whole village and their animals, she knits house cozies and all manner of other knitted delights. However, a greedy archduke has heard about this magical box of yarn and wants it for himself. What will he do to get it from this girl? A simple, silly, and beautifully illustrated story from two of the greatest of the new generation of children’s book creators. Movies in Bed: Classic Workplace Comedy! If you work in any kind of office environment, chances are good that references to the movie Office Space will crop up on more than one occasion. Whether someone is struggling with a printer or you are, like me, being oddly possessive of your stapler, there are endless opportunities to reference this movie. And for years, I have been at a disadvantage. Somehow this movie simply never crossed my path. And since for years I did not work in an office environment, I never felt I’d missed out on much. But now that I work in an office-like world (nothing like the business in Office Space, thank goodness!) I’m finding the references more than I can gloss over at this point. I picked up a copy from my local public library. Office Space was written and directed by Mike Judge, known also for the low-brow 90s cartoon Beavis and Butthead. That show never appealed to me in the slightest which may have added to my reticence to see this one. It’s about a guy named Peter who loathes his office job. When he is convinced to go to a hypnotherapist to address his issues, he is placed in a trance and told to put all his worries and cares aside. Unfortunately the hypnotherapist keels over and never draws Peter back out. So he sleeps through work, shows up with an i-don’t-care attitude, and—voilà!—everything starts turning out great for him! 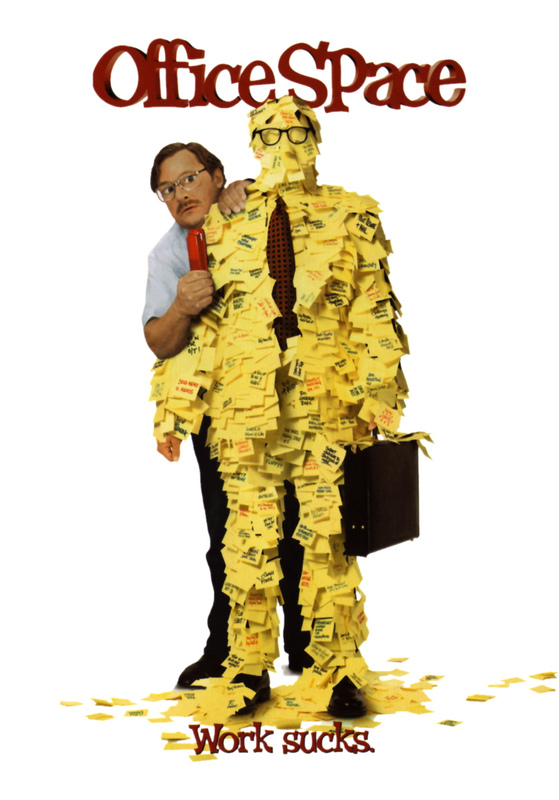 It’s a pretty funny movie, with lots of notable characters, especially the verging on psychopathy stapler guy. If you are in the minority of people who hasn’t seen this and works in an office space, you should probably go see Office Space. Posted in Movies in Bed	| Tagged Charles P. Rogers, Movie Reviews, movies in bed, Office Space	| Comments Off on Movies in Bed: Classic Workplace Comedy! Paint is a simple and relatively inexpensive decorative element, yet it can drastically change the aesthetic of any space. From a simple ivory eggshell that adds life to a dull room, to a cleverly painted bold pattern on an accent wall, paint is the decorator’s best friend, and in a remodel, should be yours too. 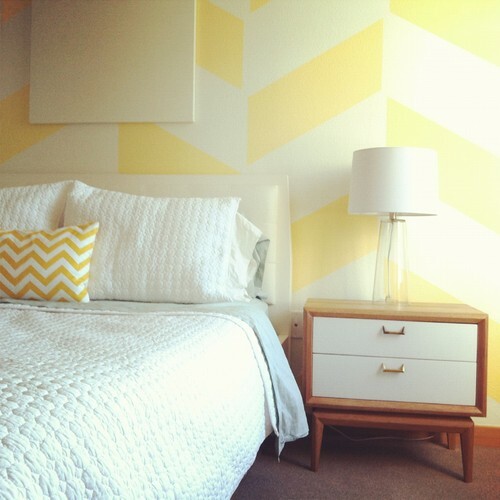 Here are five cool ways to bring pattern by paint into a bedroom. 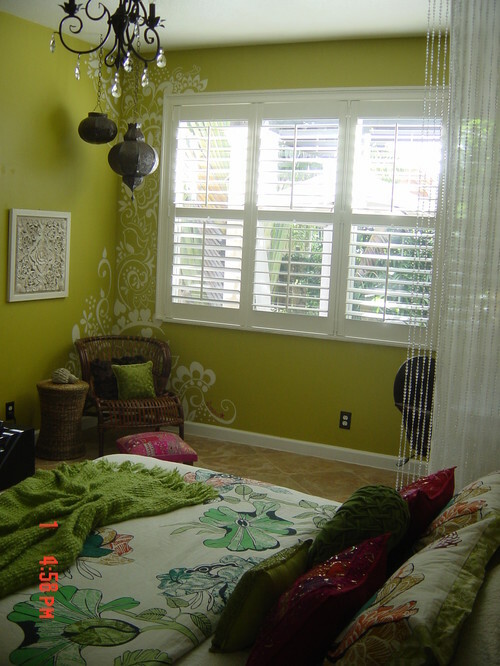 An accent pattern is introduced in this space and enhances an otherwise plain corner. Want to try this at home? Select contrasting colors, as shown, or for a more subtle effect, use similar tones. If you think wall patterns might be too busy, have a look at this graceful chevron design, which adds pizzazz and transforms this clean, almost under-decorated bedroom. 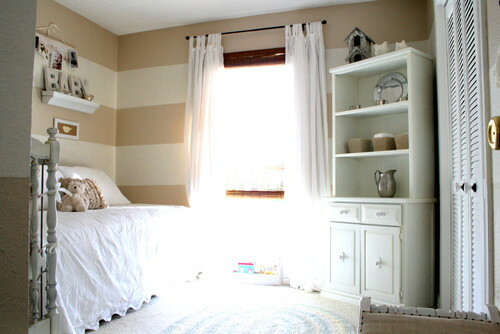 Painted stripes are a terrific wall treatment for any bedroom, including a nursery or child’s room. 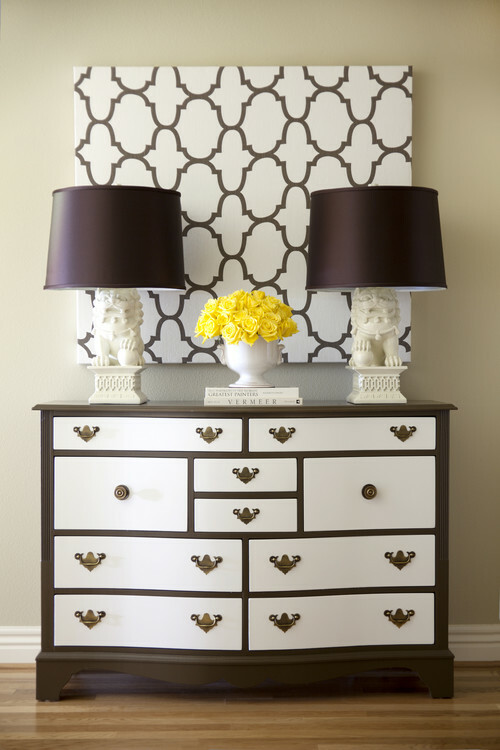 Make a statement and paint extra wide panels horizontally; or, go for a wallpaper look with narrow vertical stripes. Tone on tone or complimentary colors work nicely. Stripes typically work well above wainscoting, as well. Have an old dresser that’s ready for a yard sale? Transform the piece from shabby to chic by painting the frame a dark chocolate and the drawers a soft white or cream. If you’re lacking in the artwork department and your budget is dwindling, why not create your own? Purchase a stretched canvas, find a pattern at Cutting Edge Stencils or let your creative juices flow and come up with your own design. 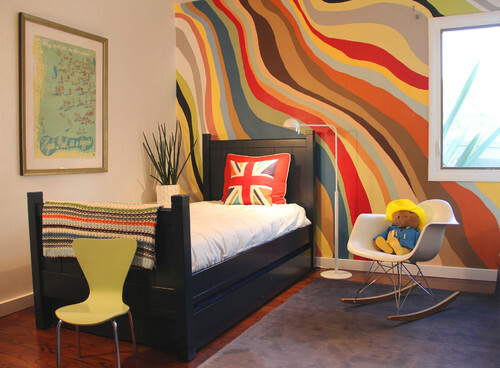 Children are entitled to a stylish bedroom, too. This wavy backdrop is a perfect motif for the in-between age, or any age, really. Great looking and not too sophisticated, this design will add color and panache to rooms with even the simplest furnishings. When I travel, I like to shop for souvenirs for friends and family back home. I search the culinary shops, seeking regional specialties, unusual items that cannot be found locally. InBermuda, that means spicy gale force pepper jam (amazing spread atop some whipped cream cheese and served with wheat crackers), tangy sherry pepper sauce (the not-to-do-without condiment for traditional fish chowder), and, of course, the inimitable rich, dark rum cake. Serving ware and kitchen gifts are also at the top of my list. When I locate a linen towel or cutting board that includes a printed recipe, my joy is doubled. On a recent visit toBermuda, I picked up a tiny little cutting board for my daughter-in-law, Lesley. Upon receipt, she politely declined saying, “Oh, I love that little board…but you got me the same one last time!” Oops! So, I kept it for myself. 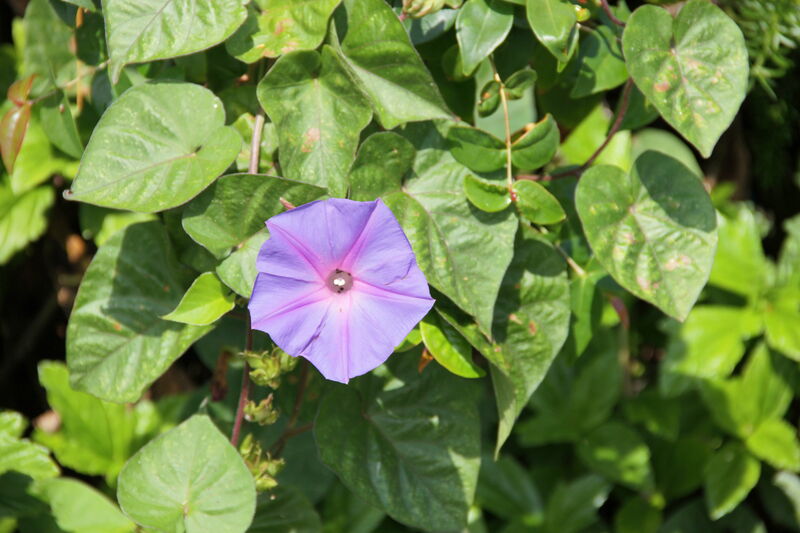 Morning Glories are prolific in Bermuda, and this sweet little board is adorned with frilly watercolor flowers created byBermudaartist Carole Holding. 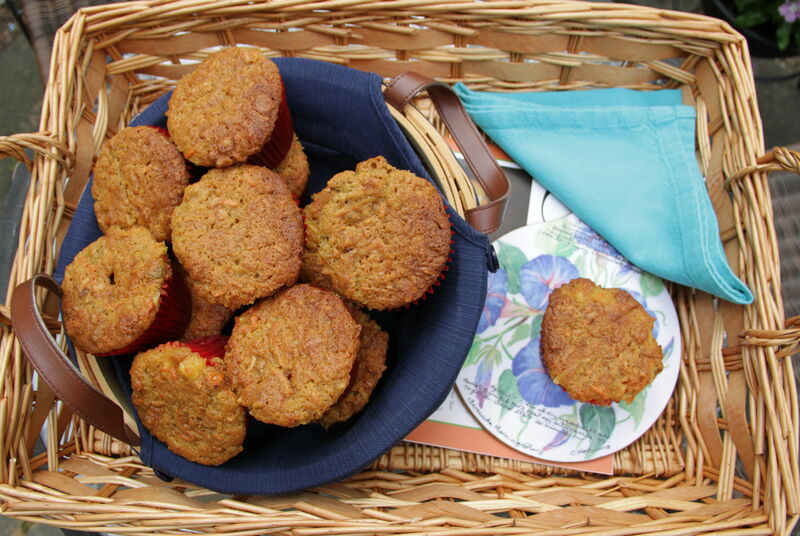 The muffin recipe is rich with carrots, fruits, and nuts. 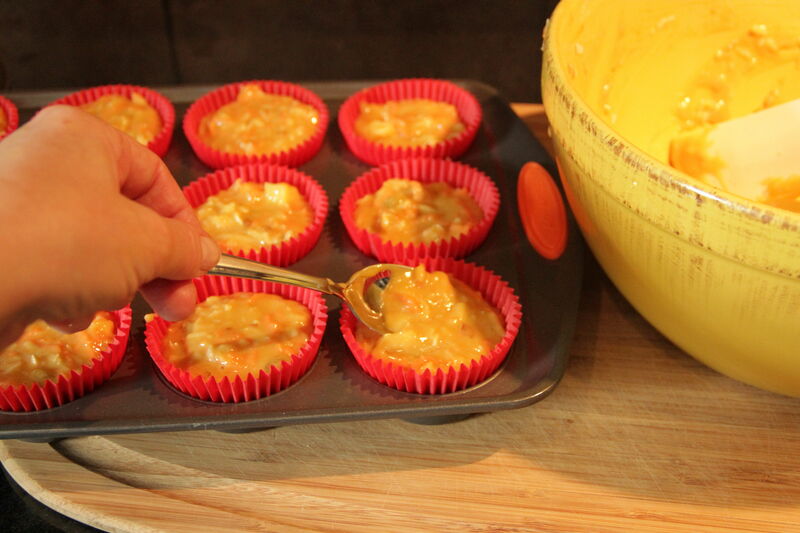 Be careful not to overfill the muffin pans – the dense batter will run over and cause the muffins to join together. Enjoy the delightfully tantalizing aroma of warm tropical fruit as your muffins bake. When finished, plop one or two on your tiny serving platter, and be transported to the lush isle ofBermudafor an artistic breakfast in bed. Preheat oven to 350°. Line a muffin tin with paper or foil liners and set aside. Sift together flour, baking soda, ginger and salt into large bowl. Stir in brown sugar. 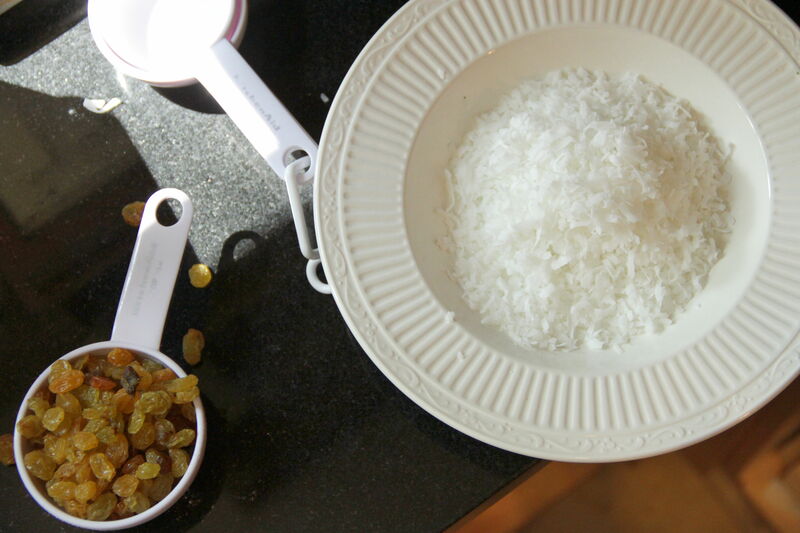 In separate bowl, beat together eggs, oil and vanilla. Mix egg mixture with dry ingredients until smooth. 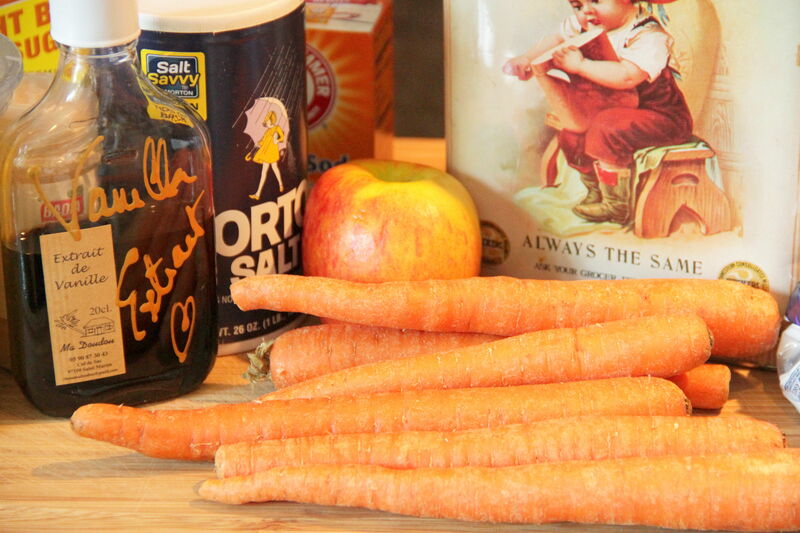 Add grated carrot, apple, pineapple, coconut, raisins and walnuts. Spoon batter into lined muffin tin and bake at 350° for 30 to 40 minutes, or until a toothpick inserted in muffins comes out clean and tops are lightly golden. Let cool on a rack at least 10 minutes before serving. Note: You can purchase spicy pepper jam from the Bermuda Jam Factory at bermudajamfactory.com; chopping boards and other original artwork from caroleholding.com.